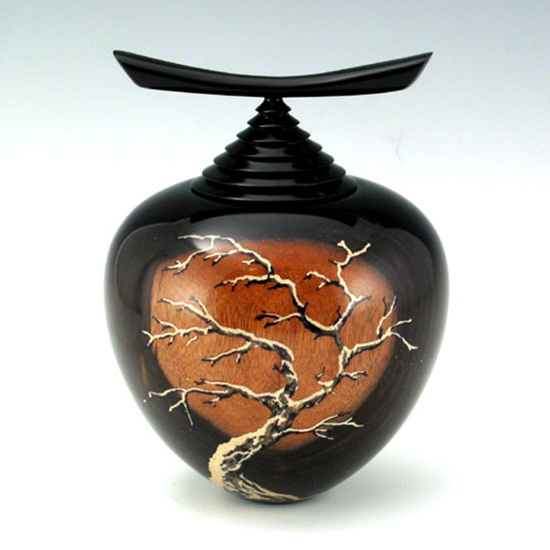 Materials: Macassar ebony vessel and African blackwood lid/finial with inlaid minerals. Finished with metal-acid dyes and musical-instrument lacquer. Comment: The lighter colored sapwood of the Macassar ebony wood provided the inspiration of a moon. Acquired by a private collector through del Mano Gallery (now defunct) at the 2007 Sculptural Object and Functional Art Expo, Chicago, IL.